Are you looking to skip all the work and stress and planning, and just be married already? Call (207) 596-7696 to start planning your elopement getaway today! We invite any and all couples to enjoy an uncomplicated approach to your wedding day with one of our Maine Elopement packages. With the average wedding fast approaching $30,000 or more, a small intimate Elopement ceremony followed by a big announcement party back home at a later date starts to make a lot of financial sense. You will also probably find that having to only focus on your chosen partner and the vows you are sharing with each other actually makes the ceremony more intimate and meaningful. With a small scheduled Elopement ceremony, you are only giving up stress and expense as you certainly will not have to sacrifice romance or the “WOW” factor. 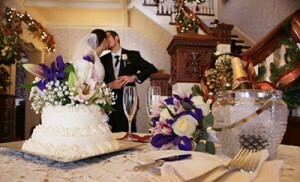 We will arrange the wedding officiate, the flowers, the cake, witnesses, dinner and a professional wedding photographer. You will just need to figure out what you are going to wear and the rings and we will set up everything else. You can choose to have the ceremony in front of the fire in the Drawing Room, by the beds of roses in the garden, on the front porch beneath the ferns, on the grand staircase in the Front Hall, under the wedding arbor in the sun-room or opt for a water location nearby. Two nights in a luxury king room with a fireplace and a whirlpool tub for two. View our Maine honeymoon packages as well! Officiate to perform the ceremony. Bridal bouquet and matching boutonniere for the groom; or two bouquets or two boutonnieres. Small Two-tiered wedding cake (choose White, Yellow, Chocolate, Double Chocolate, Lemon, Lemon-Coconut, or Marble). Professional Photographer (will take 50-75 photos and will deliver a CD/Thumb- drive the following day with a PDF file giving you full rights). $100 Midcoast Money Voucher for an intimate dinner for two and any number of our wonderful local restaurants (cab fare included). Romantic turn-down service with chocolate-dipped strawberries rose petals, and champagne. 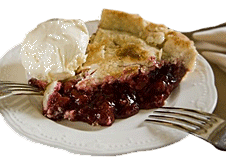 Berry Manor Inn Voucher for 10% discount on a room for your 1st year anniversary. Our standard Elopement package, as described above, is based on having the bridal couple only to escape to the inn for a 2-day package. To accommodate additional people to witness the ceremony or for a small intimate wedding, we offer the perfect location at our new property next door at the Rockland Talbot House. The new space is the Sun Room at the Rockland Talbot House and accommodates intimate ceremonies or small weddings of up to 12 people for approximately 2 hours (1/2 hour before ceremony and 1.5 hours after). The rental of this space allows for the wedding party to enjoy private space reserved just for them and other guests of the inn to continue to have unlimited access to the inn’s common areas. A small intimate elopement ceremony/wedding for up to 6 people (including the bridal couple) that includes the basics of the Elopement package above can also be accommodated. The additional event fee is up to $475 (calculated at $75 per person for adults and children of any age and an additional $175 fee for photography services). The event fee includes rental of the Sun Room space for 2 hours from 12:30pm to 2:30pm. To ensure that the privacy and needs of both the wedding couple and the inn’s non-wedding guests are met, we would require that any additional guests not staying at the inn please delay their arrival to the inn to ½ hour before the ceremony. To rent any event space beyond the 2 hour window or for a different window of time or that includes any type of reception or food and beverage service other than the wedding cake and champagne toast included in the standard Elopement Package above may incur additional charges related to equipment rentals (linens, china, chairs, etc. ), set up and clean up fees. Please discuss your requirements with us directly. A small intimate elopement ceremony/wedding for greater than 6 people but no more than 12 people (including the bridal couple) that includes the basics of the Elopement package above can also be accommodated. The additional event fee is up to $925 (calculated at $75 per person for adults and children of any age and $175 flat fee for photography services). The event fee includes rental of the Sunroom space for 2 hours from 12:30pm to 2:30pm. To ensure that the privacy and needs of both the wedding couple and the inn’s non-wedding guests are met, we would require that any additional guests not staying at the inn please delay their arrival to the inn to ½ hour before the ceremony. To rent any event space beyond the 2 hour window or for a different window of time or that includes any type of reception or food and beverage service other than the wedding cake and champagne toast included in the standard Elopement Package above may incur additional charges related to equipment rentals (linens, china, chairs, etc. ), set up and clean up fees and minimum number of rooms rented. Please discuss your requirements with us directly. We are excited to offer a new wonderful space to hold small weddings in the sun-room at the Rockland Talbot House which is directly next door to the Berry Manor Inn. We can also accommodate small wedding ceremonies for up to 36 people in this grand space when all rooms are booked at the Rockland Talbot House and overflow rooms booked at the Berry Manor Inn. Additional charges will apply for a larger ceremony depending on the details of the magic day and the number of additional people in attendance. View our Wedding Fee Schedule (PDF) or contact us for more information. For any small weddings, greater than 12 people and up to 36 people (including the bridal couple) and/or weddings that includes any type of reception or food and beverage service other than the wedding cake and champagne toast included in the “Elopement Package” above; and/or any small weddings needing event rental space greater than 2 hours or with a larger location or different wedding time frame will need to be priced individually and falls outside of the parameters of this Elopement package. Rental of the 6 guest rooms at the Rockland Talbot House or the 12 guest rooms a the Berry Manor Inn will be required to hold larger wedding ceremonies at either of the properties and may incur additional charges related to equipment rentals (linens, china, chairs), set up and clean up fees and minimum number of rooms rented. Please discuss your requirements with us directly. A local wedding stylist will help you with a wedding up-do and make-up services several hours before the ceremony to help you achieve that bridal glow. If you prefer to have the wedding stylist come to you at the inn on the big day to help with hair and make-up that also can be arranged. If you would like a “dress rehearsal” for both hair and make-up the day before just add $50. Gratuity not included. It’s the groom’s special day too! Treat your soon-to-be husband to some pampering of his own. He can enjoy an old fashioned barber techniques of hot towels infused with soothing aromatherapy that provides deep cleansing and hydration for the skin. He will enjoy an invigorating scalp massage and shoulder massage to utterly relax him for the big day. Please note this is not a barbershop shave. Gratuity not included. Enjoy a few hours of pampering on your special day. Rejuvenate your skin with a facial that features nature’s most powerful antioxidant and Maine’s signature fruit – blueberries. Pamper your hands and feet with an exfoliation scrub, soothing moisturizing massage and polish. You will feel complete refreshed, beautiful and a glow for the big day! Gratuity not included. Indulge in an hour long couples massage in the comfort of your own room. Begin your honeymoon deeply relaxed and focused only on each other as the stresses of the outside world are gently massaged away to get you ready for your big day. Gratuity not included. 48 hours advanced notice is required for booking and cancelling this service. Go to dinner in style with a horse drawn carriage ride under the stars. Enjoy one of the most romantic moments two people in love can share as the sound of the horse’s hoofs provide a melodic backdrop as you sip champagne and gaze at love. Rate includes gratuity for the driver. Advanced notice required. *** Note: Elopement or other small wedding ceremonies that will occur offsite or which request photographs at a nearby 2nd location or at a location other than the Berry Manor Inn or Rockland Talbot House or that require substantially more photography than normally included in the Elopement Package will be charged additional fees of $275 for the ceremony or $175 for just a second location for photographs. 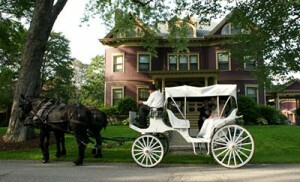 The Berry Manor Inn and Rockland Talbot House welcomes any and all couples to elope at the inn. If you have any questions please request more information. Marriage licenses are issued in Maine at any town or city municipal office. All couples regardless of sexual orientation can legally get married in the State of Maine. For people from out of state and planning to get married at the inn, you can obtain a marriage license at Rockland’s City Hall. If either of you are residents of Maine, then the license should be obtained in the town or city of residence. 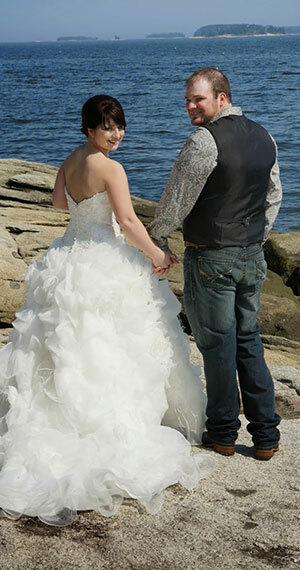 Both the bride and groom must visit the town office in person to apply for the marriage license. 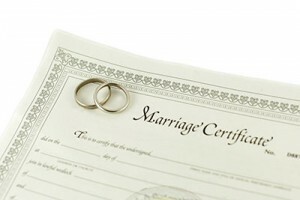 Your marriage license is valid for 90 days and can only be used within the State of Maine. There is no longer a requirement for blood tests nor is there a waiting Period from the time your marriage license is issued until your wedding can take place. The person performing the ceremony is responsible for filing the marriage certificate with the town office that issued the marriage license. There is a filing fee of $30.